Have you ever looked at your bottles and been in the mood for something a bit decadent on the tongue? 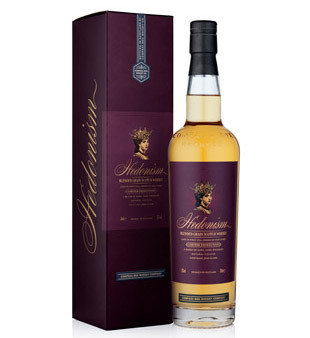 If so, Compass Box’s “Hedonism” is worth the consideration. While this is a blended grain scotch whisky, the label is chock full of information normally displayed on a premium malt whisky. Let’s consider what this means to us the drinker. First, this whisky is all grain. That means no malted barley. Keep in mind that grain whiskies tend to be lighter, less flavorful, and are generally smoother than their malted relatives. Typically, grain whiskies are blended with malts to balance out the overall flavor profile. Single grain whiskies are uncommon. Second, this is a blend. This means that casks from at least two different distilleries are used to create the finished product. In the case of Hedonism, Compass Box discloses that 10 – 15 different casks are vatted (blended) together from, usually, 4 distilleries. This is a very low number of casks to use in a blend and means the characteristics of each individual cask has more opportunity to shine. Now that we understand the type of whisky we are drinking, let’s detail a couple particulars implemented in crafting Hedonism. First, this whisky is only produced once or twice a year. Compass box claims this is because thoughtful testing goes into selecting which casks are going to be used. Since this is only 10 -15 casks being blended, it is extremely important they choose carefully to produce the profile “Hedonism” drinkers love and know. However, this could also simply be a marketing ploy to drive up demand and create an allure and mystique around the bottle. You wouldn’t be a fool to think there is probably a bit of truth in either case. Second, only first fill American oak casks (ex-bourbon) are used in the aging process. Scotch distillers love using ex-bourbon casks because most of the tannic elements of the wood are gone and the lovely sweetness remains. First fill means that the cask has yet to age Scotch whisky but has already been filled with bourbon. Nose: There is a very distinct and powerful nose here. I describe it as Christmas Spice, but you could probably break it down into vanilla, chocolate, cinnamon, and nutmeg. Taste: Carmel, chocolate, molasses, a coconut rum like quality, deliciously sweet! What is interesting to note here is that this maintains a balanced sweetness without becoming too syrupy. Finish: Basically the taste again just hanging around forever in a nice low warm glow. Exactly how you would want on a cold winter’s night by a fire. Comments: Alas, I only had the opportunity to have single dram of this, but I took my time. The strength of the flavor is surprising considering this is but a simple blended grain! I was very sad when it was gone, and this bottle has been haunting my sweet tooth dreams ever since then. Hedonism will cost you, however, but if you like rich, decadent, sweet whisky, I highly doubt that this bottle will disappoint. This has been discounted in Ontario (LCBO) to $70 CDN. Still deciding on pulling the trigger before it is gone. Finally picked up this discounted CB for $56 cdn, meh. Nothing special, enjoyed Spice Tree more.